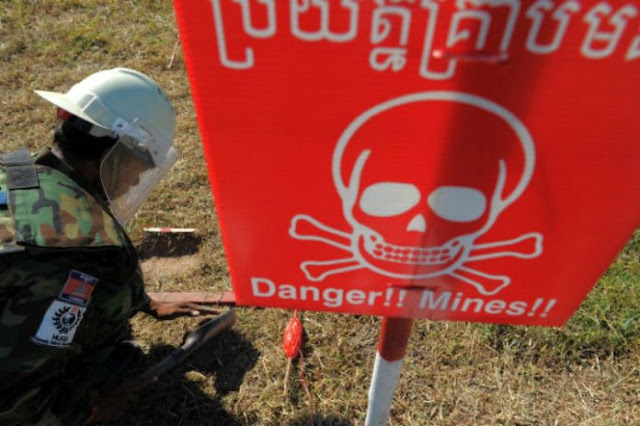 In an article by Thai PBS titled, "US cuts 2018 funding for demining operations in Cambodia," it's revealed that next year's meager $2 million in US government funding for demining operations of US unexploded ordnance (UXO) in eastern Cambodia leftover from the Vietnam War has been discontinued without warning or explanation. The move caused confusion across Cambodia's government, as well as across partner nongovernmental organizations (NGOs) in Cambodia participating in the US program. Speculation over the move revolves around growing tensions between Washington and Phnom Penh as the United States desperately attempts to reassert itself in Asia Pacific, while Asian states - including Cambodia - continue to build closer and more constructive ties with Beijing at the expense of Washington's waning influence. Cambodia has recently exposed and ousted a myriad of US-funded fronts posing as NGOs and independent media platforms executing a campaign of US-backed political subversion. This includes the disbanding of the Cambodia National Rescue opposition party and the arrest of its leader, Kem Sokha, who bragged of his role in a US conspiracy to overthrow the Cambodian government and install him into power. 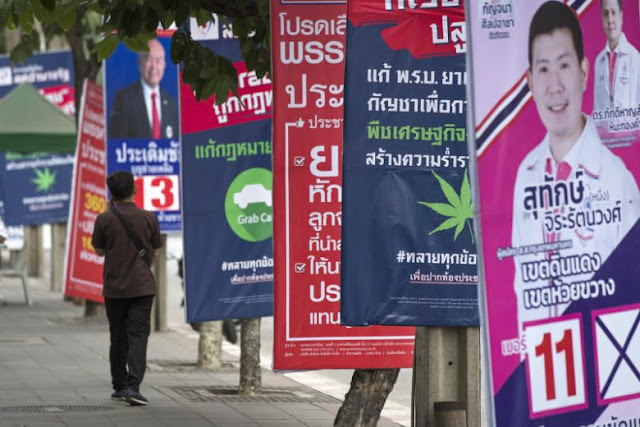 Tensions in Cambodia represent a wider, regional trend where US footholds face increasing scrutiny and resistance as Washington's abuse of "NGOs," "rights advocacy," and "democracy promotion" is systematically exposed and rolled back. The US embassy in Cambodia would claim after receiving backlash for the move that the US had unilaterally decided to shut down funding in order to open up bidding for a new and "world-class removal program" - the details of which have yet to be confirmed or released. The US boasts that it has spent "more than 114 million dollars" over the past 20 years to clear explosives it itself helped drop on Cambodia as part of its nearly two decades-long war in Vietnam and wider intervention in Southeast Asia - or in other words - the US has spent over 5,000 times less in 20 years on removing UXO in Cambodia than it does annually on its current military operations around the globe. In fact, a single F-35 Joint Strike Fighter warplane costs roughly the same amount of money the US has spent on demining Cambodia over the last 20 years. There are an estimated 6 million pieces of UXO still littering Cambodia, which since the end of the Vietnam War and the rule of the Khmer Rouge have cost nearly 20,000 Cambodians their lives - with casualties still reported monthly. Efforts that last 20 years, cost as little as a single warplane in Washington's current arsenal, and still leave people dead or maimed monthly indicate efforts that are halfhearted - a diplomatic stunt more than sincere reparations or humanitarian concern. In neighboring Laos, the United States left an estimated 80 million submunitions littering the country, or about 11 for each man, woman, and child that lives there. 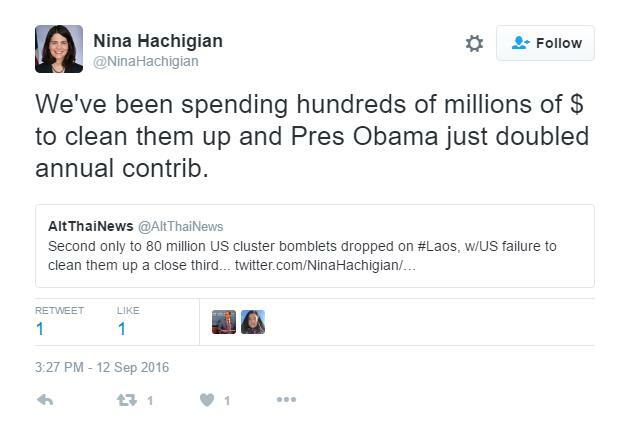 20,000 people have also been killed by UXO in Laos and many more have been maimed. According to the Lao National Unexploded Ordnance Programme (UXO LAO), 444,711 submunitions (about 0.55%) have been destroyed between 1996 and 2010. Despite the dangerous and exhausting work, eliminating 0.55% of the 80 million submunitions still littering the country amounts to virtually nothing. We've been spending hundreds of millions of [dollars] to clean them up and [President] Obama just doubled [our] annual [contribution]. In recent years, U.S. support for UXO clearance and victim assistance in Laos has dramatically increased. In response to steady pressure from NGOs like Legacies of War and their allies in Congress, U.S. funding for this work increased from $5 million in 2010 to a record $19.5 million this year. These resources, disbursed by the State Department’s Office of Weapons Removal and Abatement, are used to support clearance efforts that destroy up to 100,000 pieces of lethal ordnance in Laos annually, employing 3,000 workers in the commercial and humanitarian sectors. While the US repeatedly boasts of the "millions" that it spends to clean up a mess it itself intentionally created, at the current rate of UXO disposal in Laos alone, the country should be safe in approximately 1,000 years - or effectively - never. When Washington's remaining points of leverage in Asia Pacific include the threat of continued political subversion and destabilization and the cutting of already meaningless levels of aid to deal with a decades-spanning UXO threat - versus China's offer of economic, infrastructural, and military partnerships - it finds itself in a self-feeding cycle of decline in Asia that will - in turn - further feed its decline as a global hegemon. The cruel irony of America's clumsy, inadequate, and embarrassing UXO policy in Southeast Asia is that the annual military budget that dwarfs its UXO annual removal efforts in Asia by a factor of tens of thousands, is being used to fuel conflict elsewhere around the globe - from the Middle East to North Africa, and Central Asia to Eastern Europe - that is littering the planet with not only additional UXO dangers, but new and more horrifying threats including depleted uranium munitions and chemical weapons proliferation. While the US could potentially play a constructive, positive role in Asia Pacific, the same mentality that underpinned US foreign policy that drove the Vietnam War and resulted in the current UXO threat is the same mentality that still prevails today on Wall Street and in Washington. If that mentality and those possessing it are not rooted out, America's current state of decline will be terminal.